Each year there appear to be more events and conferences filling out the calendar for marketers, media professionals and business owners to attend. It can be difficult to know which ones are sales pitches and fluff and which offer real insight. The increased competition is great for attendees. It means competitive pricing and top quality speakers, with more opportunity to access the latest successful strategies as well as trends to watch out for. A marketing conference like no other, with no tracks or sponsor booths. The conference aims to be an immersive event for marketing professionals looking for fresh ideas. Marketing show North is the largest marketing event outside London for media, creative, digital and marketing professionals with 3,000 attendees. The event explores all aspects of the marketing mix with specialist talks across 5 theatres. MW Live aims to provide the solutions to all your marketing problems, with 4,500 attendees, a curated expert speaker list and a variety of networking opportunities. Atomicon is a digital marketing conferences with a strong focus on in-depth practical advice and the path to implementation. Attendees includes small business owners, start up founders and marketing directors. Advertising week Europe is a two day event covering with Keynote speakers, lively debates, in depth seminars and, intimate workshops. The marketing Tech Expo runs alongside the B2b Marketing Expo and aims to be the ultimate destination to modernise your marketing strategy. The event includes masterclasses and ample opportunity to network with other marketing professionals. The online influence conference is a one day conference bringing together senior business leaders aiming to transform their business across online, social and digital channels. Ungagged is a digital marketing conference giving marketers new tips, tricks, skills and best practices through practical step-by-step sessions. The App Promotion Summit is a one day, three room app growth event. Speakers include top app growth experts with plenty of chances to network. Brighton SEO is the one of the World’s most respected SEO conferences. Speakers include top industry professionals and has a focus on practical in-depth courses as well as in depth training. A three day social media event for Brands, Agencies, Creators, Influencers, marketers and freelancers discussing the tools and tech they use to grow their social presence. The Disruptive Marketing Conference brings together 16 of the brightest marketing minds across a variety of industries to discuss the strategies that have delivered growth and the learnings from those which haven’t. The Digital Marketing World forum explores the latest trends and strategies within digital marketing. The conference boasts a diverse speaker line-up of industry experts from global brands presenting the latest case studies and best practice. The CX Marketing examines the role marketing plays in consumer experience with speakers discussing the key issues, challenges and opportunities for marketers. The Brand Marketing Summit brings together marketing leaders to discuss the value of customer engagement in the era of online. Keynotes, bold talks and big ideas. Learn from leading digital marketing practitioners with pitch free speakers, discussion of the latest trends and case studies for success. Spanning 8 theatres covering advertising, emerging tech and the techniques that are working right now Ad:tech London is perfect for brands, agencies and media leaders looking to keep up with the latest trends. A generalist marketing event with keynote speeches from leading marketing practitioners and agency owners. The event aims to provide marketing expertise to business owners. A festival with a roster of heavy hitting speakers. Previous years have included Sit Martin Sorrell as well as Mark Ritson. Dedicated to brand marketers the event is a place to discover, learn and shape the future of brands. A unique and quirky event describing itself as the anti-conference. The one day event is packed with street food, bars and discussion of marketing operations and technology. An immersive week of discussion, learning and innovations for marketing professionals aiming to create a community. The 2019 theme is “closer” exploring individualism vs community with expert speakers and panels breaking this topic into bitesize chunks. Back for it’s second year after a successful launch in 2018. The World’s top brand, agency and media people gather to discuss the largest challenges, pitch the latest innovations and discover the latest and greatest marketing strategies. 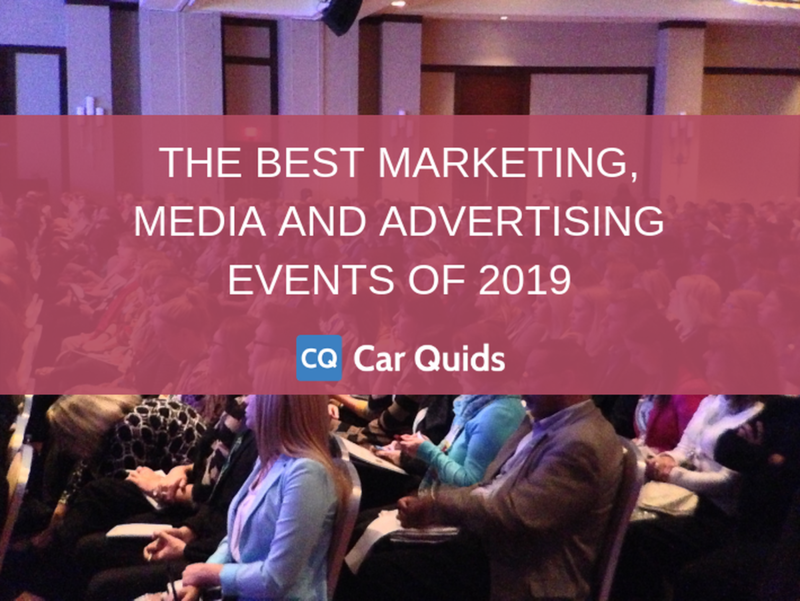 Now that you’ve seen the biggest and best marketing events and conferences of 2019, which will you be attending? Did we miss an conference you are running? Or miss your favourite event? Email ryan@carquids.com with the details and we will add it. We'll keep the list updated throughout the year with newly announced events so watch this space.